For Heriberto Quesnel universal history is the axis that directs his work. Of self-taught formation, his work oscillates between the rigidity of the academy of classical painting and the playful fragmentation of the comic strips of his childhood. 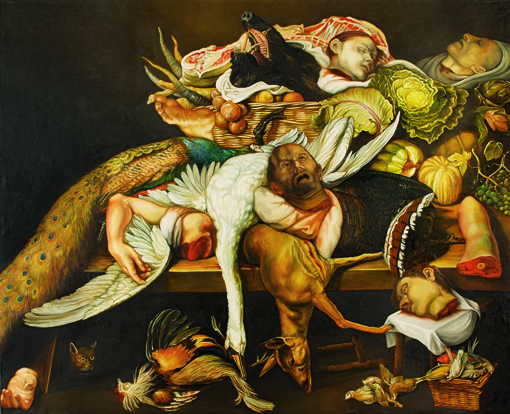 This flexibility allows him to journey with freedom between painting, drawing and photography in a vast universe of objects and characters, creating recognizable unique images through the sarcasm of his elements and the socio-political content of his subjects. Since the beginning, Heriberto has used old magazines and books that he found in libraries and pawn shops to develop his work; documents of a history that the artist has continually rewritten and reinterpreted. In his work on paper we find as well portraits of statesmen and dictators as comic strips or mass media cultural references. Quesnel work on pages from 1950's magazines and late nineteenth century publications, by crossing out and drawing, overlaying images and text to decontextualize and resignify the object, using as support fragments of past time stories to remind us that history is written again and again about itself. Quesnel began his work in the first half of the 1990's and in 1996 made his first solo exhibition. In 1997 and 1999 he received the grant of creative young people of the National Council for Culture and Arts. In the same year he entered the contemporary painting workshop of master Ignacio Salazar in the Escuela Nacional de Artes Plásticas, (National School of Plastic Arts) of the National Autonomous University of Mexico UNAM, where he developed the pictorial project The History Book with which he obtained first prize in the XXI National Encounter of Young Art in 2001. His work is recognized in Mexico and abroad: among other distinctions are honorable mentions in the third and fourth Biennial of Painting and Printmaking Alfredo Zalce 2001 and 2003, the first biennial of painting Pedro Coronel 2008, and the fourth national visual arts biennial Yucatan 2009. His work has been honored abroad in 2003 with a grant from the Vermont Studio Center residency in Johnson Vermont USA and in 2005 with the recognition of young art L'Horta in Valencia Spain where he made a series of exhibitions between 2004 and 2005. In 2011 he returned to Spain through an artist residency program abroad from the National Council for Culture and the Arts to create common border, a project in which Quesnel attempts to represent images and fragments of bodies mutilated in the war on drug trafficking in Mexico. In 2013 he was awarded with the Robert Sterling Clark Foundation grant for residency at the Vermont Studio Center in Johnson Vermont USA. Currently a member of the National System of Art Creators from National Council for Culture and the Arts, he lives and works in Oaxaca, Mexico.